Have you just got your learners permit? 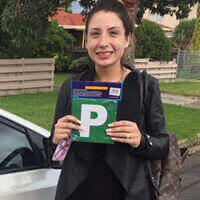 Passing your learners test is a BIG deal and the exciting first step to becoming a licensed driver. You've been a passenger for long enough and now it's time for YOU to get in the drivers seat. No doubt you can't wait to get started with your first driving lesson. You might even feel a bit nervous about making mistakes and not knowing what you’ll be expected to do. There’s no need to feel stressed with L2P Road Ready. We promise there will be no nasty surprises. As soon as you meet your instructor you will feel at ease. Our instructors love driving and want your lessons to be fun. A relaxed training session means you will enjoy your lessons and learn faster. Your very first lessons set the important foundations for all the new skills you will learn as you become a safer driver and ultimately pass your driving test. Wherever you live in the west we are available to help you take the first steps as a new learners permit holder. Because our instructors have been driving in the western suburbs since they were learners they know exactly which roads are best for beginners like you. Every day we are teaching new learners to drive so we know that making you feel comfortable will help you to learn all the new skills you’ll need to eventually drive on your own. Awesome driving instructor. When I first got in the car I was a robot that couldn't turn a corner now I have my Ps which I never thought I'd get thanks heaps Michael. Your a great instructor and thank you for pushing my limits and believing in me. Are you a bit nervous and unsure what to expect in your first driving lesson? Let us put your mind at ease by explaining what will happen when you start learning to drive. On the day of your lesson we will usually meet at your home. Your instructor will explain how to use the main controls of our driving school car. Don’t worry if you don’t remember everything straight away. We will get you started with some simple skills away from busy roads to allow you to pick up the basics of controlling the car without pressure from other traffic. Your instructor will patiently guide you through every step of the learning process so you’ll know exactly what to do next. Your safety is our first priority so we also have dual controls (an extra set of pedals) to help out if you make any mistakes. By the end of your first lesson you will have a good understanding of how to control the car and will have had a lot of fun. If you want a driving school with a proven record of happy customers give us a call or send us a message. Our goal is to help new learner drivers like you take the first steps towards building safer driving skills that you will use for the rest of your life.